2 sovrum, 2 badrum stuga på en ranch i vinlandet, max 4 personer. Landet inställning av denna charmiga 2 sovrum, 2 badrum stuga på en hö och boskap ranch är en utmärkt plats för en fredlig semester eller händelse fylld resa. Den har ett fullt utrustat kök med ugn. Det har disk och köksredskap för att njuta av en hemlagad måltid hemifrån. Det finns en sovrumssvit med en king size-säng, ett privat badrum och klädkammare. Det andra sovrummet har en queen size-säng och det finns ett andra badrum med dusch / badkar kombination. Satellit-tv, tvättmaskin och torktumlare, strykjärn och strykbräda läggs till bekvämligheter. Kabinen ligger bara några minuter från den historiska staden Templeton och andra historiska platser i närheten. Always super clean. So enjoyable to sleep in a tranquil environment. We absolutely loved this cabin. It was far enough from town to not have all noise but close enough totown to grab what we needed. We spent the majority of our time on the awesome deck and outside dinning area. During our stay they brought in some bulls and cows that stayed right in the front yard. The dogs were a little intimidated. The yard was perfect and was the safest place fir the dogs to go out in. This place gad everything we needed and more! We will be returning to this spot again! Well located great value place. We enjoyed our second stay at the Casita. Our host Cecilia is very helpful and keeps the entire place very clean and welcoming. This place is ideal for 2 couples as each bedroom has its own bathroom. We will be back! This was our second stay here and we loved it just as much. It's a working ranch with stunning scenery. The wrap around deck is great! Both times we have come has been during cooler weather so we haven't been able to have dinner on the deck yet, but it's an ideal set up for that. Close to Paso Robles for wine tasting, but still has that in the country feeling. As in the past, we had a lovely stay in this beautiful and peaceful place. The cabin is clean and a great place for a small family or 2 couples. It's our "get away from the rest of the world" place. We did not even turn on the TV but did enjoy the wifi. Communication with Cecilia is easy and she is quick to respond. 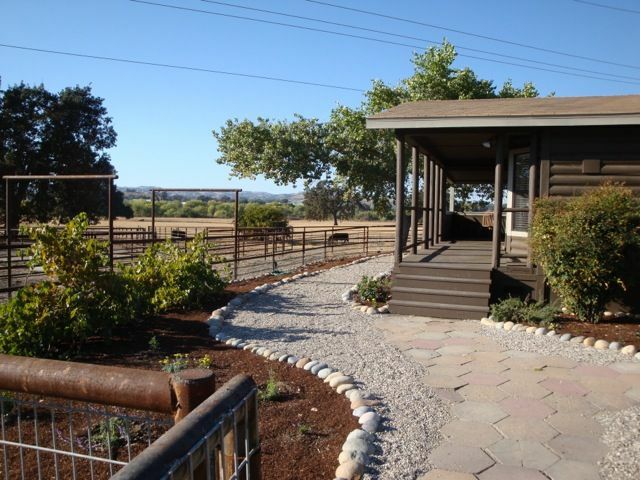 The cabin is close to restaurants and wineries in the Templeton area and convenient to wineries in Paso Robles as well as Downtown Paso Robles. We love staying here and look forward to when we can return. Stuga som ligger på en hö och nötboskap i Templeton, Kalifornien, bara 25 minuter till Central Coast stränderna i hjärtat av vinlandet. Miles till ned staden Templeton.